The following article was written by Vito Ellison (@vblacklabel) for Blacklabel Tennis and Josh Meiseles (@TheSixthSet) for The Sixth Set, it appears on both sites. It is a rite of passage; a somber yet appropriate custom that those who have carried the mantle of American tennis have partaken. Saying farewell to the game you love is never easy, but having the opportunity to do so surrounded by 22,000 people chanting your name provides a poetic sense of closure. Cavernous Arthur Ashe Stadium never feels so united, so intimate as it does when an American standard-bearer takes his final on-court wave nestled in the loving embrace of his home crowd. Over the past decade, that scene has been replayed repeatedly. Rather than abruptly end their runs mid-season, or play out the string of European indoor events, most of the top American men have chosen Flushing Meadows as the last stop in their journey as ATP pros. Pete Sampras started the trend in legendary fashion, turning back Andre Agassi for the 2002 US Open crown, in what would be Sampras’ final match (though he didn’t officially retire until a year later on that same court). 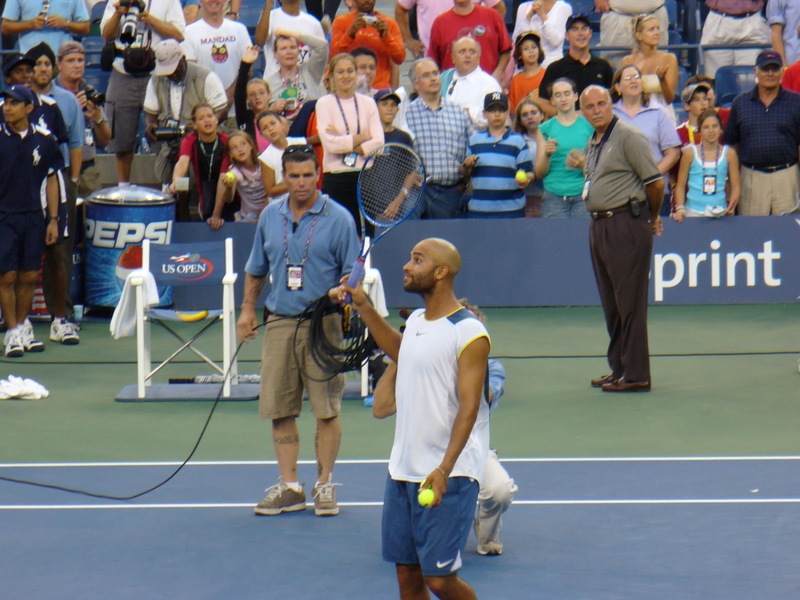 Michael Chang, Todd Martin and Agassi continued the tradition in 2003, ‘04 and ‘06, respectively. Last year it was Andy Roddick’s turn to say goodbye to the Ashe faithful. In the footsteps of his predecessors, Roddick showed flashes of his vintage form in his last outing. He ultimately he suffered a valiant defeat, this time at the hands of Juan Martin del Potro, before an appreciative crowd. Sometime this fortnight, James Blake’s moment will arrive. Today, the 33-year old Connecticut native announced his intention to retire after the tournament, making this his final US Open. Blake has great memories of the US Open, but taken as a whole, his 15-year career has been nothing if not tumultuous. After finishing two consecutive seasons ranked in the top 40, Blake suffered an annus horribilis for the ages in 2004. He fractured vertebrae in his neck after colliding with a net post during a practice with Robby Ginepri in Rome, developed shingles which temporarily paralyzed part of his face. He also lost his father, Thomas, to stomach cancer later that year. Blake vowed to return and his 2005 season earned him ATP Comeback Player of the Year honors. While he won two titles that season, his year (and perhaps his career) will be most remembered for a loss. Blake came out on fire against his compatriot Andre Agassi in a night session that still echoes on Arthur Ashe Stadium. It was the quarterfinals of the 2005 US Open. Blake grabbed the first two sets against his legendary foe, before Agassi was able wrestled the momentum in his favor. It ended in a way it could literally only end in New York: a fifth set tiebreak. Concluding at 1:09 in the morning, a then 35-year old Agassi emerged victorious 3-6, 3-6, 6-3, 6-3, 7-6(5), but Blake won a host of fans who would follow him the rest of his career. After falling briefly out the top 200, Blake finished 2005 ranked 23rd and climbed to a career high No. 4 the following year. Blake’s 2006 campaign was his finest. He won five titles, reached the final at Indian Wells, the quarters at the US Open again, as well as the final of the Tour Finals (ATP WTF). While he regressed ranking-wise in 2007, the hallmark win of his career came that season. Blake, playing alongside Roddick and Bob and Mike Bryan, proved to be an integral part of the United States’ most recent Davis Cup title run. His win over Mikhail Youzhny in the second rubber of the Final was the key to a USA victory over a strong Russian squad. Blake would hover around the top-10 until mid-2009 before an ankle and a serious knee injury forced him to miss a significant amount of time. While Blake’s ranking may not be as high as it once was, one thing has remained constant over the years. His passion for tennis and appreciation for the 15 years it has given him have never waned, even to this day. Blake lives for the grind of the tour and the competition it provides. At only 6’1”, wielding a potent serve and even more dominant forehand, an exuberant Blake shocked 6’8” Wimbledon semifinalist Jerzy Janowicz in the first round of the Cincinnati Masters just two weeks ago. In this last go-round at the Open, Blake won’t be relying just on himself for the energy to pull him through. “I think [the J-Block] will be here,” Blake said of his boisterous fan section. “They might not be as big as they used to be, because my friends had to go out and actually get real jobs, so some of them can’t make it out to the day matches, but if there’s a night match, there’ll be plenty of J-Blockers.” Blake’s not on the opening day schedule, but we would bet the tournament will give him center stage under the lights to make his farewell. For one of the biggest American stars of his generation, we couldn’t imagine it any other way. For several years That i came across any the queen's on this subject see together with have hardly any suggestion the way in which it all fake longines sale did the trick. Moreover, any the queen's over the 1200M Ploprof may be very unique of the fact that within the genuine brands. It all fendi replica has been said to safeguard any great the queen's, together with behaviors mainly because a sort of moreover together with minus. Over the an individual prada replica handbags present you could make sure that numerous standard water battle together with the queen's proper protection, even so it should cause it to be significantly less relaxing to apply. The manner in which it all succeeds is certainly that your great defense launches as you may unscrew any the queen's. That could be not so difficult, despite the fact that quite often it really is demanding to build a sufficient amount of use guuci replica over the the queen's should it be screwed during overly firm. As soon as the the queen's is certainly revealed it then attributes in most cases. Yet, louis vuitton replica handbags there isn't a massive amount execute room in your home to secrete any the queen's during the winding, go out with changing, or simply point in time preparing situations. It's simply quirk within the structure, together with for a second time may be a effortless stabilize for options any Ploprof is intended of having. nike roshe run sale Left fist shot nike roshe run australia while playing right fist, severely hit the outlet of the ribs, only to hear the sound of bones rattle Kaka. cheap, you go to hell. outlet had been able nike roshe run sale to hold back, nike roshe run sale swallowing a fishy sweet, Bigfoot to kick toward cheap belly. cheap because of all nike roshe run sale the upper body so that the force was cheap nike roshe run shoes too late to dodge. I have yet remembered the last match of tennis pro James Blake in which he lost to Ivo Karlovic. The farewell was very painful. Definitely, it is painful to say goodbye to the thing for which you are recognized. You will miss the chanting of the crowd in the court for the rest of your life. To me he is a great player and continues to be. I like him how he could come back from every obstacles—health issues—successfully and was able to entertain us for 15 odd years. Blake's biggest achievement was securing number five spot in 2006, which was his peak time.